You may not have a rifle of less than 26" overall length, or it becomes an AOW (Any Other Weapon). In most states, you can just pay a tax for it, get local LE sign-off, and own an AOW - it's just a bit of paperwork. You may not have a rifle with less than a 16" barrel, or it becomes an SBR (Short Barreled Rifle). Permanently affixed barrel extensions DO count for your 16" however, so a 14.5" barrel with a 2" flash hider counts as a 16.5" barrel for these purposes. In most states, you can pay a $200 tax stamp, get local LE sign-off, and own an SBR - it's just a bit of paperwork. Generally, you may not have any weapon which discharges more than one round per pull of the trigger. Double barrel shotguns don't count here, by the way. You may purchase, in most states, registered machine guns. The prices on these are on an upward climb due to dwindling supply - no new ones since 1986. You may, if you possess a Class-3 FFL (not 03), purchase "dealer sample" machine guns as long as you have a request-for-demonstration letter from a law enforcement or military agency. This is one area which draws a lot of interest in gun discussions. Some states issue, others don't. Because concealed carry is not a big focus on this site, this section is populated with links to other useful sites. 5.11 Tactical's CCW Reciprocity Graphs - which collates information on raw numbers of states with reciprocity. USA Carry's CCW Reciprocity Maps - an interactive map which helps identify which states your carry permits are valid in. Guns with "sporting" purpose, or "curio and relic" status, can be imported into the US. A non-C&R rifle, in order to be imported, must qualify as a "sporting" rifle as defined by Title 18 USC § 922(r) (commonly known amongst gun circles as "922(r)"). Or, it may be assembled with fewer than 10 imported components in order to qualify as a domestically built rifle. There used to be a "gunsmith" FFL, but no longer. It has been replaced with the Type 01 Limited FFL, which does not permit acting as a transfer dealer. You may purchase a weapon, modify it, and sell the modified weapon, but you may not sell unmodified weapons. The Type 01 Limited is more of a pain to acquire than the old Gunsmith FFL was. The Type 03 Curio+Relic license is very easy to get, but also does not permit you to act as a transfer dealer. It only permits you to acquire and dispose of Curio + Relic weapons in order to enhance your own collection. It also has economic benefits; you can get dealer pricing from a large number of websites. Some in-business dealers have recommended http://www.rkffl.com/ as a helpful site for getting the I's dotted and T's crossed in setting up a new shop. The C&R license is more specifically covered at in its own seperate article. 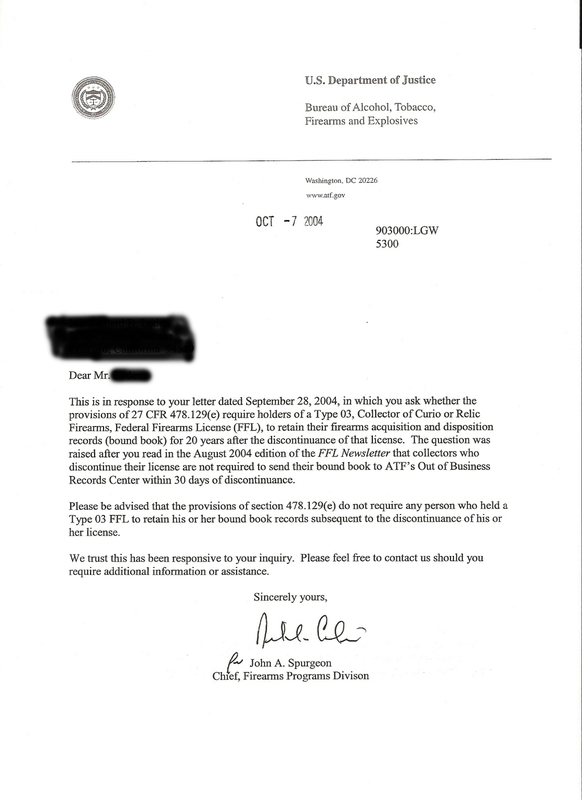 You must maintain your 'bound book', however you don't have to send it to the ATF if your license expires, according to this letter from the ATF. Generally, you need a Manufacturer's license to manufacture firearms. However, it has been a long-held and arbitrarily enforced position of the BATF that any substantial change to a firearm is "remanufacturing" a firearm and should thus incur excise taxes. In 2007, President Bush signed a highway bill that included an amendment exempting manufacturers of fewer than 50 firearms per year from these taxes. Hit http://www.nraila.org//Legislation/Read.aspx?ID=1711 for all the information I have. What I do NOT have is whether this applies to FFL holders only, and if so, which types of FFL holder.